Such a deep word, well at least for me. Deployment. It has been more than 8 months since he left home to go overseas. 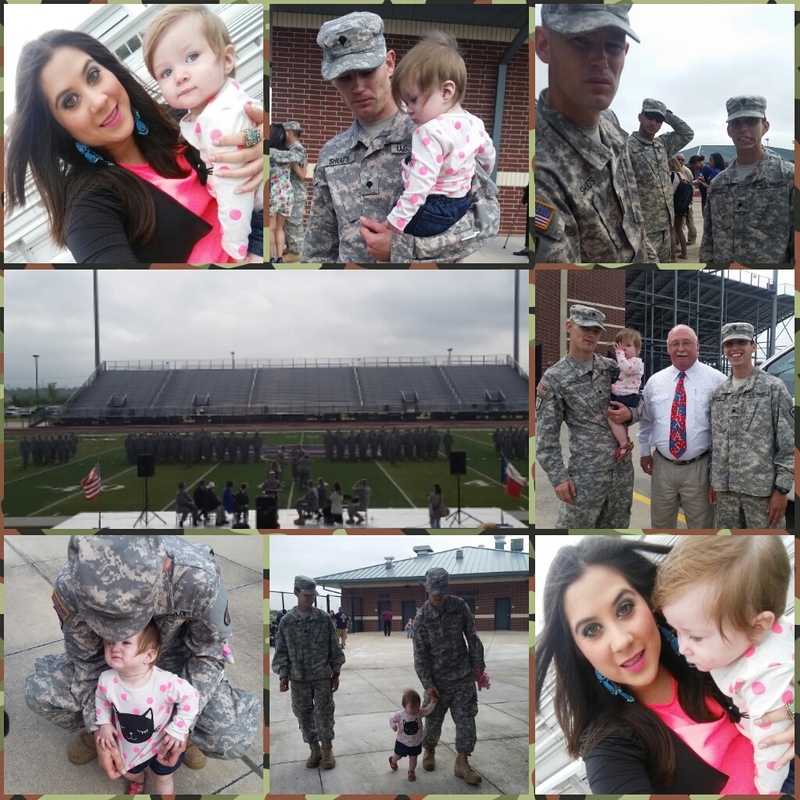 At the beginning I was lost as this was the first deployment that I was going to face in my life and my husband and I had only been together for 2 years and we had just became new parents on 2014 of a beautiful baby girl. Our first baby, my first time being a mom ever, I was lost. I was scared, it was too much for me to take at once. Being a new mom, having a full time job, living alone again. I had been alone for a lot of years and I mean alone, my parents had separated and in that process we had lost everything they went different ways and I stayed renting a room at an aunts house that offered me her home. I felt alone, with no one there to care for me, to ask for me, to guide me, to love me. I finally had what I had been looking for, my little family and at the moment of hearing the news at that moment that he told me he was leaving my heart just fell apart, I felt this huge pain on my chest, I felt like I could not breathe. I cried, I just didn’t like the fact of being on my own with my baby. The first month was the hardest for me, it was the waking up and knowing he was not there. It was the getting on to the usual routine of coming back from work, rushing to get home pick up my baby buy something fast so I could make some dinner. See him coming up the stairs in the apartment and then having dinner together. It was the getting stranded at the side of the road and me wanting to call him but then being like “wait he is not here” so then to me having to find out, call people, text them for help to see if someone would help me. It was the getting used to not having him at home to help me with our baby, that if I had to work late or if I had an event I would be like baby can you pick her up today I am still working. It was those quick runs to the store when I was in the middle of cooking or noticed we did not have milk, diapers, or anything that was needed at that time that he would just run and go get them while I would be at home with our baby. It was the getting used to, doing it all on my own but now with a baby. Then the idea started getting in my head that he was no longer home, that I couldn’t just call him and he would be there to help. That it was just me and my beautiful Milan. We talk every day via the Fb Messenger video call, so that always gives me peace to keep the communication going. So 1 month, 2 months, 3 months went by and you start getting used to it, you start finding ways on how to do things, when to do them and how to make them work, you adjust. It hurts, you still miss him but you get used to it. You just deal with it. You deal with the fact that it does not matter how you feel or how sad or depress you get that is not going to bring him back so you try to move on, to try to not think about all the moments when he was home because it hurts. You just think and pray that he will be okay and that God gives you the strength to keep moving! The 4th month comes by, the 5th and the 6th it hits you again. The holidays are coming and this would be the first Christmas that we were going to spend in our first home which we bought while he is still deployed, so that means he has not seen our first home, he has only seen it through pictures and videos. Now this was also a hard process to go by alone with a Full Time Job and a baby but yeah all that happened around September. In the 6th and 7th month which were November and December those months were a little hard. Spending thanksgiving without my husband which would had been our first Thanksgiving together as a married couple and it would had been our first Christmas as well as a married couple. So yeah with this deployment we have missed a lot of first times. It does not mean we cannot recreate but the time lost never comes back. There are a lot of things that Military families sacrifice, a lot of military moms that are living like a single mom, struggling holding the fork at home, keeping it together. Some are full time moms, some are full time moms and full time employees, some are going to school, working and taking care of their kids. It is just hard. From my own perspective you really need to love your husband with all your heart to support them. Military life is not for all. It is not for the selfish, it is not for the greedy, it is not for the unfaithful, it is not for the weak. Deployment really has it’s way of testing your love, your loyalty, your friendship, your mind, your soul. I am still in the deployment period he is not coming home yet, we still have several months to go to be back together again. I can tell you that this deployment has changed my life, my perspective towards life, it has renewed myself, it has made me stronger, appreciate life, open my eyes to my surroundings, it has made me a good mom, a good wife, a good employee, a good person. It allowed me to find myself, after being lost and afraid of being alone. It made me see that nothing is impossible that I am a women capable of so many things and that their is no limit to pursue my dreams and strive every day to be better for my baby and for my husband. I am not saying I like this deployment because I don’t, what I am saying is that we are the ones that make it what we want it to be. Have your Soldiers back and they should always have yours. Don’t let them down and support them through this difficult journey. Soldier On, because that’s what moms do.